The Atlantic harbor seals that reside in the exhibit on the Aquarium Plaza can often be spotted bobbing in the water, napping or playing with toys. Sometimes you can catch them during a group lap swim! In this post, we explain how the harbor seals and fur seals use very different techniques to glide through the water. The fur seals use their long, flexible front flippers to propel themselves through the water. The harbor seals use their hind flippers and body to glide through the water, their short front flippers are used more for navigation. 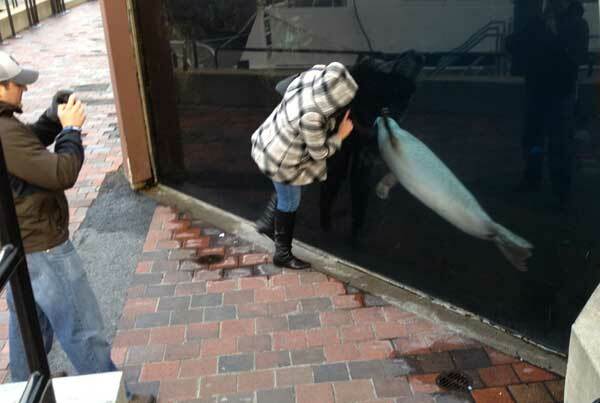 Visitors love interacting with the seals on the Aquarium's Plaza. Come by to watch the seals in action at the New England Aquarium. Pay attention to see how they move through the water, then head inside to compare the harbor seal swim with our fur seals and sea lions. There are many different ways to get moving, and that's OK. Just stay active!